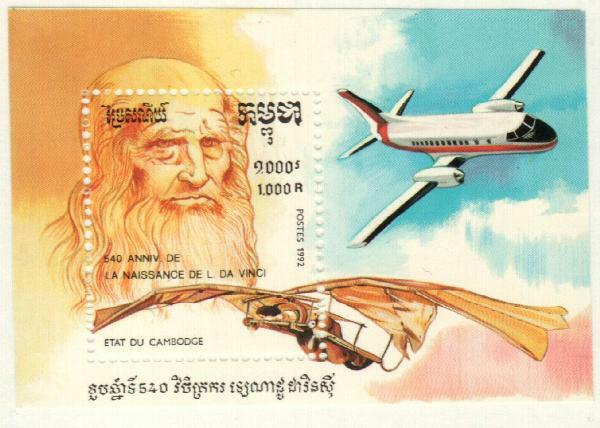 Cambodia #1217 was issued for da Vinci’s 540th birthday. Renaissance Man Leonardo da Vinci was born on April 15, 1452, in Vinci, Republic of Florence, Italy. Da Vinci’s full birth name was “Lionardo di ser Piero da Vinci,” meaning “Leonardo, (son) of (Mes)ser Piero from Vinci.” He had little formal education but learned Latin, geometry, and mathematics as a child. 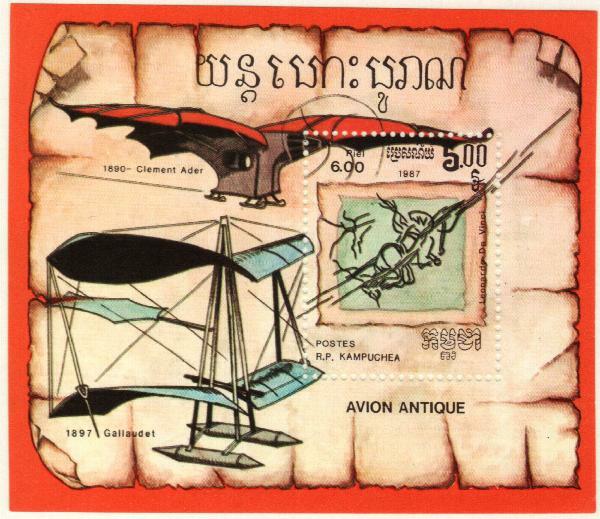 Cambodia #804 pictures one of da Vinci’s flying inventions. When he was 14, da Vinci began an apprenticeship with artist Andrea di Cione, also known as Verrocchio. Working as a studio boy for seven years, he learned a lot about drafting, chemistry, metalworking, plaster casting, leather working, carpentry, painting, sculpting, and modeling. During this time, da Vinci likely helped paint some of Verrocchio’s works. 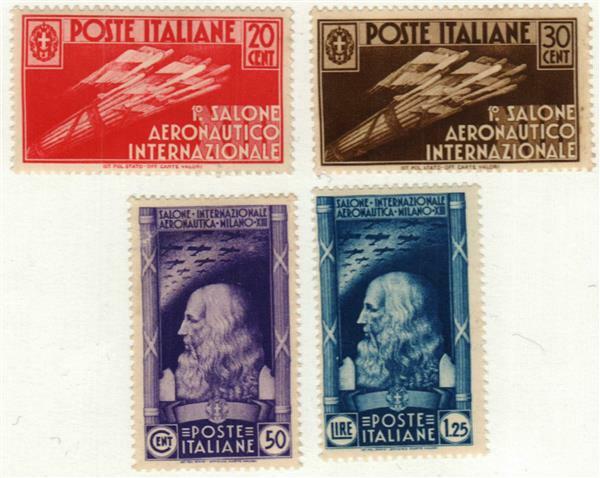 Italy #345-48 includes two da Vinci stamps. By the time he was 20 in 1472, da Vinci was a master in the Guild of Saint Luke, an organization of artists and doctors. He also had his own workshop but continued to work with Verrocchio. In 1478, he received a commission to paint an altarpiece for the Chapel of St. Bernard in the Palazzo Vecchio. He received a second commission in 1481 for The Adoration of the Magi. Neither was finished as da Vinci went to Milan in 1482 to deliver a silver lyre he’d made as a peace offering to the Duke of Milan. Italy #400-09 – The purple stamp in this set pictures da Vinci. Da Vinci remained in Milan until 1499. During that time, he painted Virgin of the Rocks and his famed The Last Supper. Da Vinci also spent much of his time in Milan working on projects for the duke, including floats and pageants for special occasions, designing a dome for the Milan Cathedral, and a monument to Francesco Sforza. 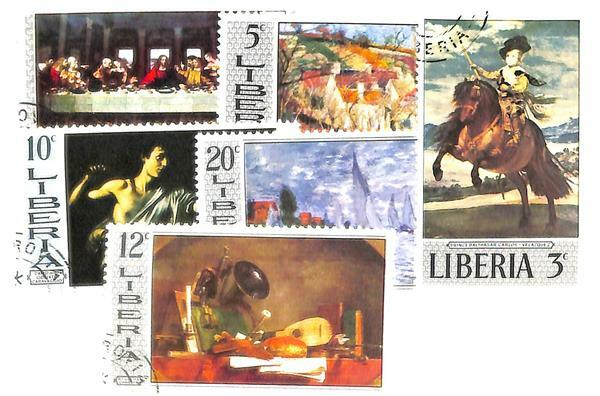 Liberia #489-94 includes a stamp picturing The Last Supper. When the French invaded Milan in 1499, da Vinci fled for Venice, where he worked as a military architect and engineer, providing plans on how to defend the city from a naval attack. The following year, he returned to Florence and created The Virgin and Child with St. Anne and St. John the Baptist, which was so popular, people came from great distances to see it. 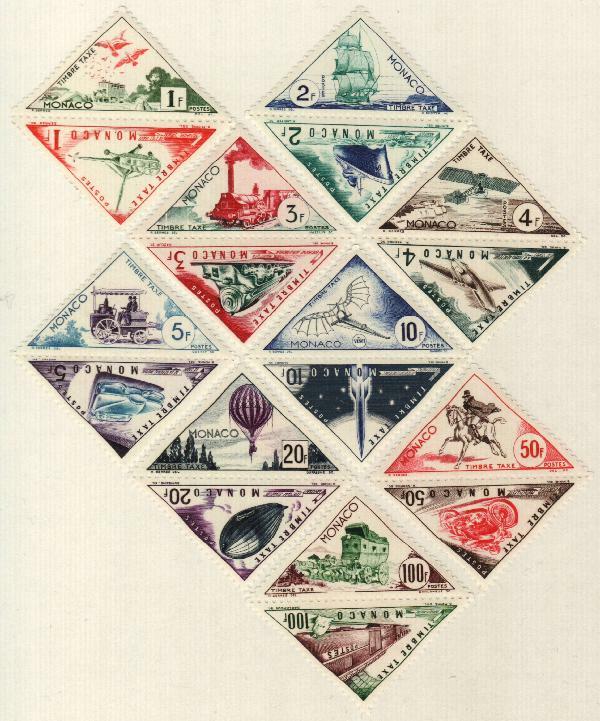 Monaco #J39-56 includes a blue 10F stamp picturing one of da Vinci’s inventions. Da Vinci continued to work as a military architect and engineer, producing maps for Cesare Borgia that helped him develop military plans and positions. Over the next few years, he spent time in Florence and Milan before going to Rome. After the French captured Milan, the king of France hired him to build a mechanical lion that walked forward and opened to reveal lilies. After that, da Vinci spent the rest of his life in Amboise, France, in the king’s service. Da Vinci died on May 2, 1519. 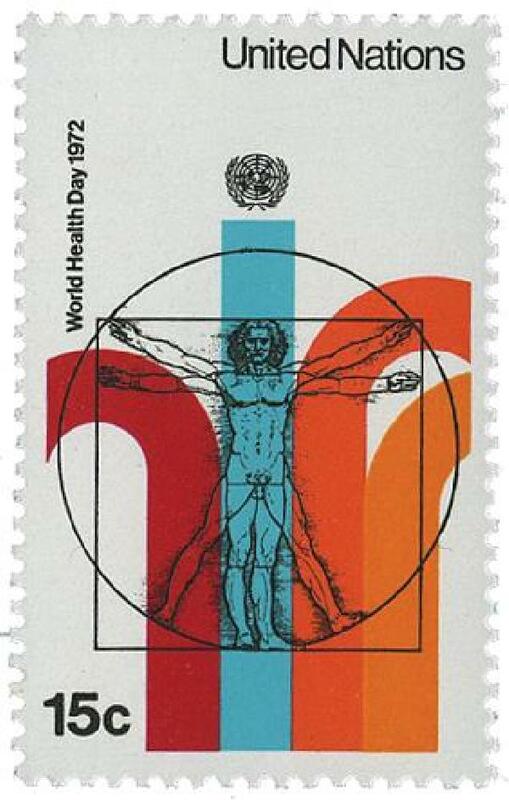 United Nations #UN228 pictures the Vitruvian Man. Click here to visit a neat website that explores da Vinci’s varied interests and click here to view his complete works. This entry was posted in April 2018, This Day in History. Bookmark the permalink. One Response to "This Day in History… April 15, 1452"